– FREE one year update to latest version. – Get hundreds of beautiful designer templates! Category: Multimedia & Design. Tag: AMS Software. Life is full of memorable moments that we want to capture and keep for years to come. Weddings, birthdays, get-togethers, parties and vacations leave behind hundreds of photos, and one day you decide to arrange them in a nice way. That’s when Photo Collage Maker will come handy! 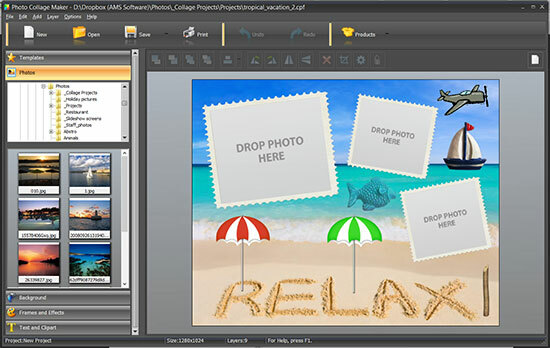 This convenient photo collage software will become your favorite tool for making picture collages, personalized photo albums, beautiful scrapbooks and other creative projects. 350+ amazing design templates along with a plethora of editing tools will give your photos a new look! The software is truly intuitive and convenient. A step-by-step wizard will help you create a great-looking design in a few mouse clicks. No steep learning curve, and no computer skills required! A huge set of themed templates lets you create hundreds of unique projects: photo albums, scrapbooks, postcards. There are templates for wedding, holidays, family, school events etc. 60+ stylish frames help you add a custom touch to your photos – elegant, vintage, bright or funny, as you wish. 150+ fancy masks let you change the photo shape or create fantastic blends. Want to crop photos and fix colors? No external tools are needed – edit photos right after putting them on the canvas. All essential editing tools and artistic image filters are at your disposal. Love scrapbooking embellishments like flowers, beads, or ribbons? Find them in the clipart gallery! 200+ cute clipart images are arranged into themed groups: love, flowers, travel, etc. A verse, a quote, or a simple caption on your album page or greeting card are sure to attract attention if you play with the variety of text settings: fonts, colors, shadow, rotation etc. Planning to share your creations via email or upload them to Facebook? There’s nothing easier! Save collages as JPEG, PNG, GIF, BMP, TIFF. You can even save optimized JPEG for the Web. The smart print module allows you to print your designs on any type of paper, and enter your own page dimensions if necessary. 300 to 600 dpi print resolution ensures excellent output quality!